A lot of people are into mountaineering and hiking. And most of the time, these people travel by group. Hence, you might want to consider investing in a tent that can accommodate up to 14 persons. Instead of bringing a tent each person, you can save a lot by having a durable and high-quality shelter that can house that many people. However, the search for these heavy-duty and spacious tents is not natural. 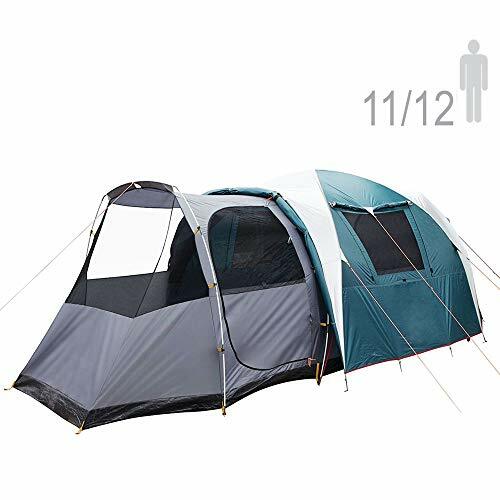 Many are disappointed and ended up with a tent that is either hard to assemble, easily blown by the wind, or cannot accommodate the given number on the product description. Allow us to be your guide in choosing the best 8-14 persons for campers. 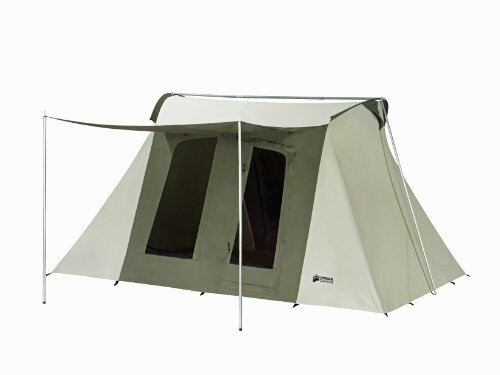 Introducing the family tent from Kodiak canvas. This heavy-duty tent can provide comfort for up to eight people. This is perfect for strong winds and heavy weather because it’s made out of hydra-shield and 100% cotton duck canvas. It’s waterproof, breathable, and can protect against the harsh elements of nature. You can also walk around inside the tent because of its high ceiling height. Two large D-shaped doors are placed on the front and back of the tent. It also has four large windows with no-see-um mesh to protect you from the bugs while allowing the sunlight in. 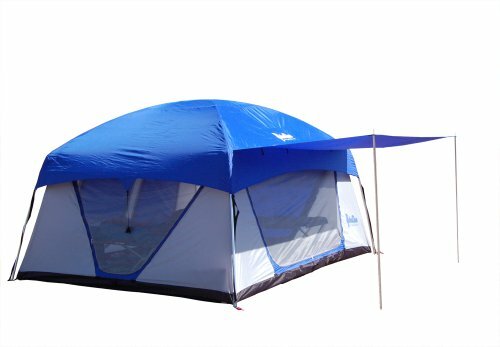 It has two funnel-flow vents to provide a comfortable temperature inside the tent for all its occupants. 65 lbs are heavy for traveling. Coleman is known for manufacturing quality camp products over the past two years. This instant cabin from the company provides a spacious interior that can accommodate up to two queen air beds. It also has a room divider for the added privacy of the user. The poles are pre-assembled for easy set-up. It takes no more than a minute to set up the tent on the ground and it’s ready to use. This model features a built-in window and mini-rain-flies to protect you from the harsh elements of nature. Also, the Illumiline reflective guy lines allow you to have greater visibility, especially during nighttime. The WeatherTec system’s patented welding floor and inverted seams keep the water from seeping into the tent. It’s a great tent to use even when it’s raining very hard. The two storage pockets allow you to store your gears and valuable items inside. Rain seeps through the door zipper. This family camping tent from TY & WJ is the perfect tent for your weekend getaway. With a ground vent and large windows, you get to experience superior ventilation with the product. The dome tent offers a spacious interior for 8-10 persons and can even allow you to move and stand freely inside. Setting up the tent takes less than a minute, thanks to its unique design. The tent is made out of waterproof Oxford fabric for superior durability. With proper use and maintenance, it can last for an extended period. It can withstand four seasons account, so no need to worry about snow and rain when camping. Robust steel frames are installed to ensure stability once you’ve set the tent up on the ground. Are you looking for a tent for your upcoming camp? Check out this model from Paha Que Wilderness, and your search might be over. This blue-and-silver tent features a removable room divider with a built-in zippered door for added privacy. The spacious interior of the tent can accommodate up to eight adult persons. Also, an adjustable mesh gear loft is included in the package. Two removable gear hammocks are suspended under each window for superior durability. For storm protection, there is a large built-in rainfly to shield occupants from the heavy weather. You can use the large main door as an awning. A set of awning poles are also included in the package for added privacy and maximum protection from the harsh elements of nature. Built-in doors are installed on both corners to access the room with ease. It also helps you to have proper ventilation and improved visibility. Mesh prevents proper air circulation. Traveling in groups or family? Well, worry no more because the 14-person tent by Tahoe Gear is all you need. This large yet comfortable family cabin is perfect for beach day camping, mountain hiking, and can even be used for outdoor events. 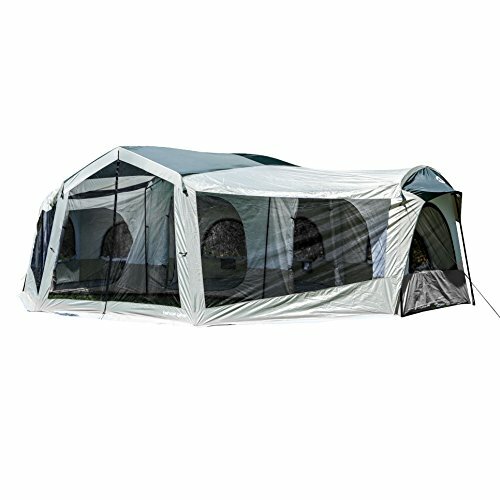 The 7-foot center and wall height allow you to stand and move freely inside the tent. It is made out of durable 1000m polyester to protect in both dry and cold season. With proper use and maintenance, this tent can last for many years to come. Also, it features a fly canopy that extends out over the door to provide extra large vestibule. Two guy ropes can be seen on each side of the tent to ensure stability, especially during windy days. The fly features solar shield that helps you to stay cool even during summer days. It also allows the sunlight and air to seep inside correctly. Disassembly takes half an hour. 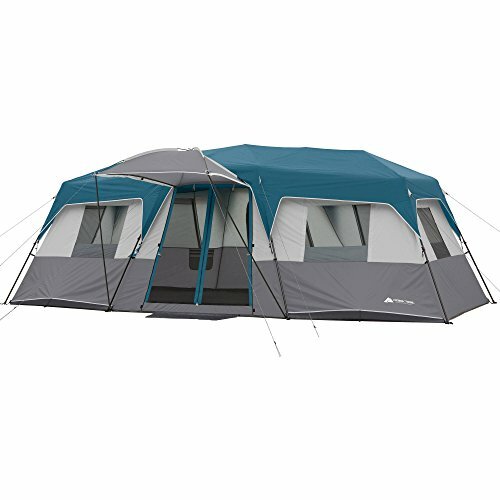 This spacious 12-person tent is the key to a great weekend getaway with your family. It features a detachable room divider to give privacy to the occupants of the shelter. Two doors for easy accessibility and three large windows to provide proper ventilation. 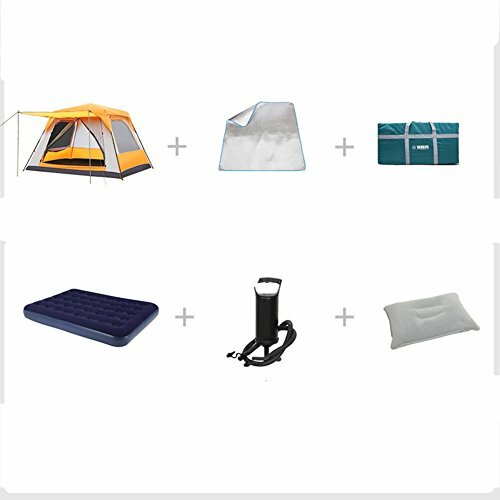 Also, the unique design of the tent allows you to set it up in just a few minutes. The poles are color-coded for easy reference as well. This tent features a double layer 190T polyester laminated with polyurethane to protect the occupants from the harsh UV rays and heavy weather. 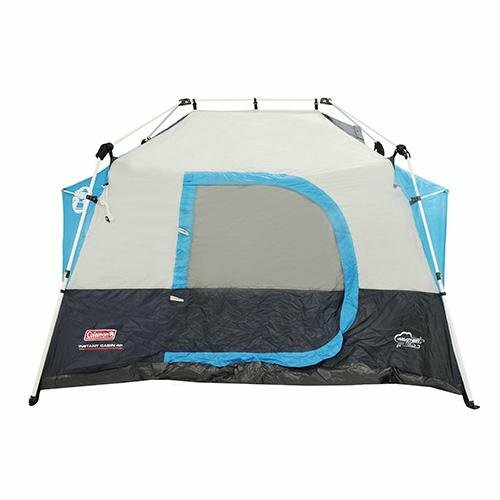 It has large D-shaped doors with mosquito mesh to prevent insects and bugs from entering the tent while offering a great view. The fabric is breathable thanks to the tent’s ultra-thin polyester. For maximum comfort, the floor material is made out of heavy-duty anti-fungus seamless polyethylene with an inner silver coated layer that keeps the occupant dry during rainy days. The bathtub-style construction assures you that you wouldn’t wake up in a puddle after a rainy night. 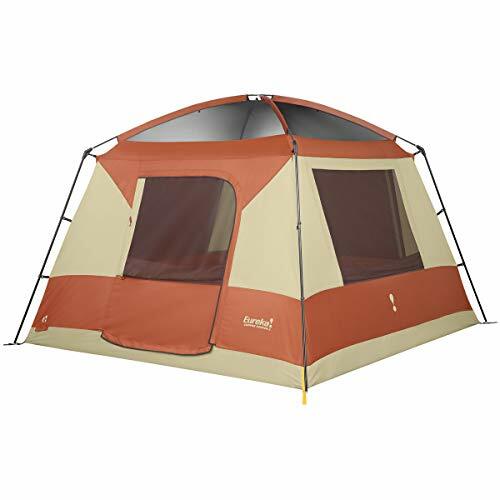 This cabin tent from Ozark Trail can accommodate up to 14 adult persons. 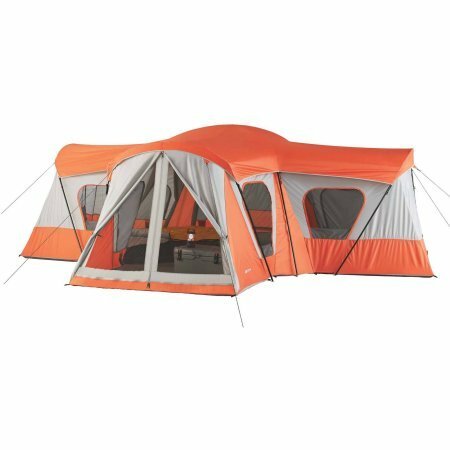 It comes in vibrant orange and grey color; this tent will allow you to have a good night’s sleep this coming weekend. It’s designed for busy mountaineers and relatively easy to set up. In just a few minutes, you can now have your tent on the ground. A manual is included for an easy assembly. The spacious interior will allow you to place up to three queen-sized airbeds inside with lots of space for your other things. The tent is built to last. It can withstand all four seasons throughout the year. The poles are made out of high-quality steel and sturdy, ensuring high stability in the long run. Note that all rooms of the tent have their entrance to provide excellent access. 50 lbs is bulky for traveling. This 9-pole cabin style tent can cater up to eight persons. It has a high ceiling height, allowing you to stand inside without difficulty. Also, the removable divider curtains add more privacy to the occupants of the tent. It has half-windows for easy access. Two large D-shaped doors placed on both sides. Six windows offer high visibility and ventilation. The full mesh assures you that no insects or bugs can easily disrupt your peaceful sleep. It also helps in reducing condensation inside the tent. This large family cabin that can cater up to 12 persons can be set up in less than two minutes. The poles are pre-attached to the tent for easy set-up. It can accommodate for up to four queen-sized beds for greater comfort. The 3-room layout and two removable room dividers offer added privacy inside the tent. It also features rain fly with factor sealed seams to provide full protection from the harsh weather. Also, there are two oversized side vents that can improve the air circulation of the tent. The extra-large windows allow the sunlight and air to stream inside. Two doors, one located in front, and the other on the back, allows easy access. There are storage pockets for your valuable items and a carry bag for storage when not in use. 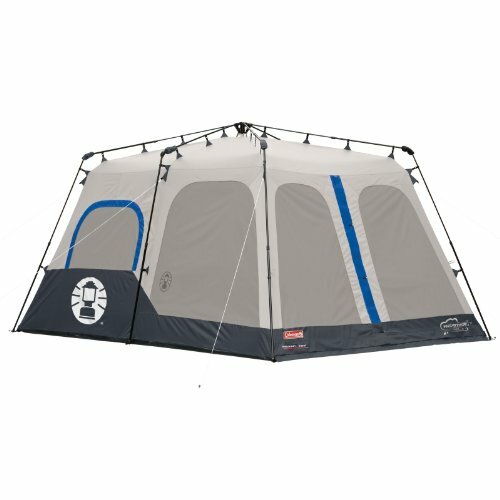 Another masterpiece from Coleman is their 8-person family tent. The spacious interior allows the user to place up to two queen-sized air beds. The shelter is easy to set up and will not take more than a minute. Just follow the three necessary steps of the manufacturer, and you’re good to go. Similar to the other products of Coleman, it also features a WeatherTec system with patent welded floors and inverted seams. In that way, water will not seep in during rainy days. It can keep the ground dry at all times. The tent is made out of rugged poly guard 2x double thick fabric. It can withstand all four seasons and can last for a long time with limited use. Poles are color-coded for a more comfortable set-up. The instant setup by the Coleman company makes this tent the ideal option for weekend getaways and on-the-spot camping trip. Issues with the door zipper.